FRONT ROYAL, VA — On January 22nd, hundreds of thousands of demonstrators will take part in the forty-first annual March for Life in Washington. They will be dutifully ignored by Big Media (well, the Post might send an intern), but it's clear that the City of Man wishes they would go away. They won't. And while their very presence might be offensive, their message often offends even more, especially when the Thought Police get involved. Pro-lifers often refer to the hundreds of millions of unborn children killed by abortion worldwide as "the Holocaust of the Unborn," or simply "the Abortion Holocaust." This introduces into the public square a battle over language, anthropology, and history. Consider: the motto of the U.S. Holocaust Museum's "Comprehensive Campaign" is "Never Again." The pro-lifers marching to end the Abortion Holocaust most certainly agree with that sentiment, but others assert that they are trespassing on private property. Opponents of abortion must find another term, they insist. The only "Holocaust" was the death of six million Jews in Hitler's death camps. That historical reality is unique. ...pro-life marchers — among whom there are many Jews — believe that commemorating the murder of fifty million helpless unborn innocents in America in no way diminishes the suffering or the dignity of six million innocent Jews murdered in Nazi prison camps. "That was a relationship that took a while," said Mr. Foxman. "When Cardinal O'Connor first came, he compared abortion to the Holocaust. But, you know, he learned." 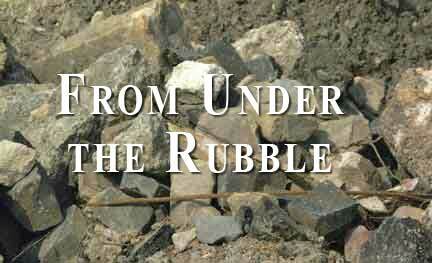 Having observed Cardinal O'Connor in action over the years, the Rubble is not so sure. Nonetheless, Mr. Foxman is not alone: Earlier this month, the Israeli Knesset gave preliminary approval to a bill banning the use of "Holocaust symbols" if they were not used for "educational or historic purposes." The bill's supporters are evidently spurred by what they perceive as a "rise in anti-Semitism" around the world. In reporting the story, the New York Times wryly notes that "Prime Minister Benjamin Netanyahu and other politicians routinely invoke the Holocaust in warning against the Iranian nuclear threat." Some are apparently permitted to employ the term, while others are not. When in 1998 Pope John Paul II canonized Edith Stein, a Jewish convert to Catholicism who died at Auschwitz in 1942, Mr. Foxman complained to the Times, "It's an unnecessary and painful act. It's another step towards Christianizing or universalizing the Holocaust. By saying everybody was a victim, it's a way of saying the church had no role or responsibility." Yes indeed. The allegation of Catholic responsibility for Hitler's death camps has circulated for years, especially in anti-Catholic circles. Countless books and articles routinely blame popes,"Christian" Nazis, and the allegedly complicit Catholic Church for the crimes that have no equal. The notion of Christian guilt is so thoroughly bound up in that version of the Holocaust that to question it is forbidden. In fact, complaining that collective guilt is not enough. Dr. Efraim Zuroff, head of the Israeli office of the Simon Wiesenthal Center, once insisted that "a public pronouncement of an acknowledgment of guilt by Christians is important, but it's equally important to combine such declarations with active work in education to demonstrate feelings of remorse." Here the Holocaust emerges both as a cherished proprietary symbol and a theory of history. So the defense of the term is intrinsically bound up with a scathing offensive against those who would purloin it. Catholics need not plead guilty to Mr. Foxman's charge. Those pro-life marchers — among whom there are many Jews — believe that commemorating the murder of fifty million helpless unborn innocents in America in no way diminishes the suffering or the dignity of six million innocent Jews murdered in Nazi prison camps. All those helpless, innocent murder victims are dear to Our Lord in His infinite love. Yet, like so many issues in our "diverse" culture, the controversy brings to mind the admonition of Confucius that we must strive to restore the proper meaning of words. And in its silence, the Catholic Church has contributed to this deterioration of language. After all, Mr. Foxman addresses a Church in which the central truth of the Holy Sacrifice of the Mass as understood by the church fathers and the saints of old is rarely taught. This teaching views Christ's Passion and Death on the Cross as the "Perfect Holocaust." Christ's Passion and Death on the Cross [was] the "Perfect Holocaust." At every Mass, we pray that this sacrifice of Christ, the unblemished victim, "may be acceptable to God, the almighty Father." As the "Spirit of Vatican II" shifted the meaning of the Mass from "sacrifice" to a "shared meal," however, few Catholics ever learned of the bloodless Sacrifice of the Mass as the "Perfect Holocaust." "Some postconciliar approaches" that present "the notion of the meal as the overriding category of understanding" are insufficient, explained Bishop Arthur Roche, of Leeds, at the 2005 Synod of Bishops in Rome. "A theology of the Eucharist viewed predominantly through the lens of the meal is deficiently devoid of the Eucharist's necessary and intrinsic link with Calvary and Christ's sacrifice," Bishop Roche explained. [A] vigorous and faithful renewal of the Church's teaching is an indispensable preamble to the success of the "New Evangelization." There are many fundamental teachings — about the Sacraments, morals, and other basic truths of the Catechism — that millions of post-Vatican II Catholics have never heard of. The latest issue of the Bellarmine Forum magazine helpfully addresses many of them. Clearly, a vigorous and faithful renewal of the Church's teaching is an indispensable preamble to the success of the "New Evangelization." Meanwhile, LifeSite News reports that the Knesset will soon approve legislation that will provide free abortions to Israeli women from 20 to 33 years of age. It is unlikely that the Knesset will embrace the notion of the "Holocaust of the Unborn" any time soon.